Gagarin 205 along with the iconic Fuzz club are the two best live music venues in the city. With a capacity of about 1.200 people and excellent tech spec and acoustics, Gagarin provides everything needed to host spectacular shows. However, Gagarin is something more than just a great live music venue. Neon parties, happenings and hip film festivals like the Greek Cult Film Festival take place there regularly. Some of the greatest gigs I’ve seen in my life took place at this spot. From John Cale, Sivert Hoyem and The Gathering to some of my favorite local heroes like Baby Guru, Chickn, A Victim of Society and Monika. 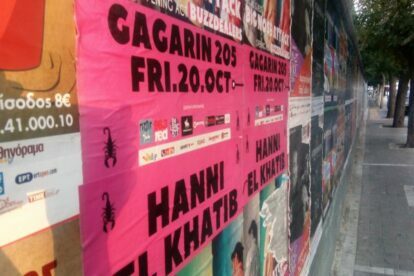 Gagarin has always a very interesting programme to offer, bringing some of the greatest international acts while making room for some of the best Greek bands and other forms of art. Check their website to see if there’s something cool coming on when you visit Athens!